Principles of food fortification and supplementation. Part 1 Technological aspects: Forms of food supplements; Vitamin and mineral fortification of foods; Fortification with substances other than vitamins and minerals (polyphenols, carotenoids, fatty acids and phytosterols); Healthy polyunsaturated fatty acids (PUFAs) for food enrichment; The stability of vitamins in fortified foods and supplements; Technical aspects of micronutrient addition to foods. Part 2 Analysis, safety and regulation: Vitamin analysis in fortified foods and supplements; Analysis of fatty acids in fortified foods; Polyphenol and antioxidant analysis in fortified foods and supplements; Assessing the bioavailability of nutraceuticals; Codex Alimentarius standards affecting fortified foods and supplements; European legislation on fortified foods and supplements; Safety of vitamins and minerals added to foods: An overview of international expert opinions on micronutrient safety. Fortified foods and food supplements remain popular with today’s health-conscious consumers and the range of bioactives added to food is increasing. 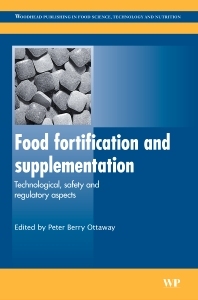 This collection provides a comprehensive summary of the technology of food fortification and supplementation and associated safety and regulatory aspects. The first part covers methods of fortifying foods, not only with vitamins and minerals but also with other nutraceuticals such as polyphenols and polyunsaturated fatty acids. It also includes a discussion of the stability of vitamins in fortified foods and supplements. The second part contains chapters on the analysis of vitamins, fatty acids and other nutraceuticals, as well as a chapter on assessing the bioavailability of nutraceuticals. It concludes with a discussion of regulation and legislation affecting fortified foods and supplements and a chapter on the safety of vitamins and minerals added to foods. Food fortification and supplementation presents current research from leading innovators from around the world. It is an important reference for those working in the food industry.